Providing humanitarian service, encouraging high ethical standards, and helping to build goodwill and peace. 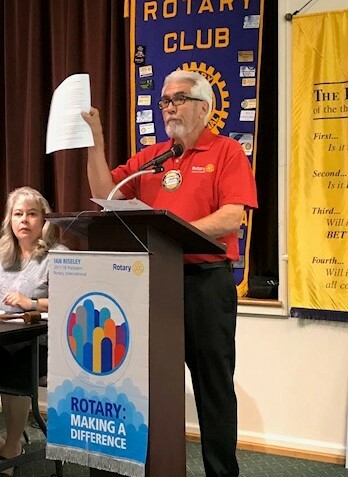 Rotary is an organization of business and professional people united worldwide who help provide humanitarian service, encourage high ethical standards, and help build goodwill and peace. The Rotary motto is Service Above Self. Rotary International (RI) consists of the 33,000 Rotary Clubs scattered over 200 nations with over 1.2 Million members. 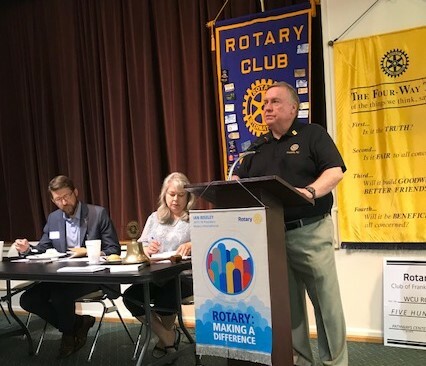 The Rotary Club of Franklin is one of the oldest clubs in Rotary. We were chartered on 10 November 1927, twenty two years after the formation of Rotary. Our sponsor was the Rotary Club of Waynesville. In turn, we have sponsored clubs in Bryson City (1934), Highlands (1945), Franklin Day-Break (1997) and Clay County (2011). Our focus has and continues to be on Service – thru support of such things as Scholarships, Four Way Test Program, Community Care Clinic, Scouting, READ2ME, Group Study Exchanges, Foreign Student Exchange, PolioPlus, Wheelchair Foundation, Panamanian rural school, Ecuadorian Prosthetic Clinic, and several others. Our Membership has proudly provided four District Governors – CS Brown, Dennis Sanders, Gary Bray, and Gary Dills in 2016-17. 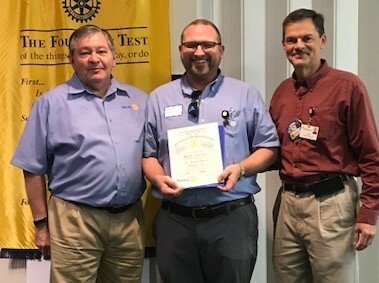 Rotary Club of Franklin inducts new member, Brett Harris. Member, Dennis Sanders, encourages member to go on the upcoming CART cruise to raise money for Alzheimer’s Research. 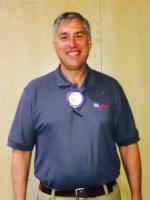 Franklin Rotarian, Duncan Cooper, is presented with the Paul Harris Fellow award. Pictured: Gary Dills, Dennis Sanders, Duncan Cooper, Stanley Rushton, Judy Chapman. Member Tom Coley kicks off the Roy Rickman Fundraiser. 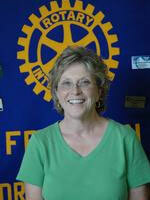 Franklin Rotary Club partners with Rotary Club of Waynesville-Sunrise to raise funds for the WCU Rotaract Club. Pictured are Judy Chapman – Franklin Rotary; Lane Perry – Waynesville-Sunrise; and Dennis Sanders – Franklin Rotary. From time to time, everyone needs a helping hand. 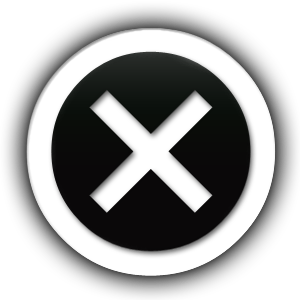 That includes community groups and nonprofit organizations, whose membership and funding tend to ebb and flow. 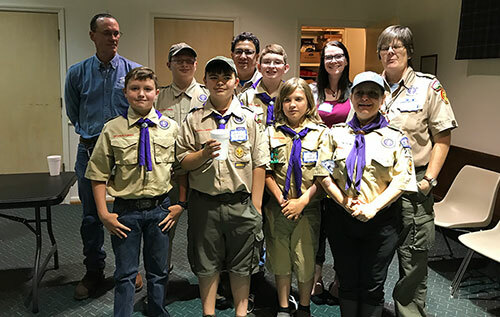 Boy Scouts of America Troop 202 found a friend years ago when the troop partnered with the Rotary Club of Franklin – a partnership that was solidified on Wednesday when the Rotary Club renewed the troop’s charter. Troop leader Charlie Vargas updated the troop’s progress over the last year, which included an increase in membership. “We are pleased to say that we have picked up 12 new scouts,” Vargas said. “It’s a pleasure to go out and see the patrols working together. In the past, with as few as eight active scouts in the troop, there was no way to break the group into patrols. Now, with a roster of 20 scouts on board, the troop can function as it was intended. Vargas and six of the older scouts are busy planning a trip to Philmont Scout Ranch in New Mexico as long as an ongoing wildfire in the area doesn’t interrupt their travel. 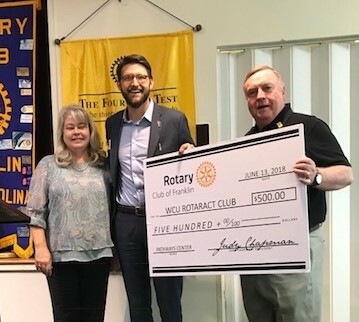 Rotary Club of Franklin president Judy Chapman presented Vargas with a check for $1,000 to support the troop’s activities. 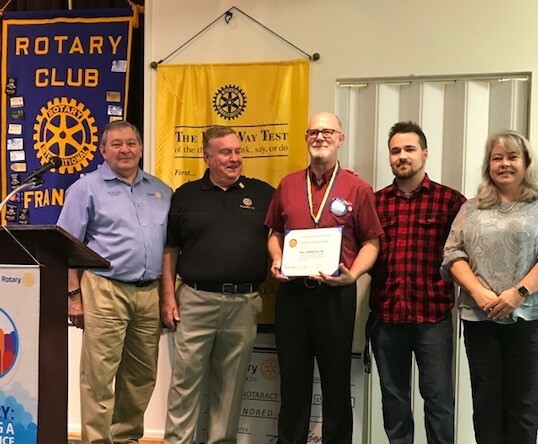 The Rotary Club also funded $600 for a scout who lost his mother earlier this year and was unable to raise the funds necessary to go on the Philmont trip. Boy Scouts of America Daniel Boone Council unit commissioner Lucy Thorne did the honors of renewing the Troop 202 charter. Troop 202 meets at 6 p.m. each Monday, except for holidays, at the Slagle Building on Memorial Circle in Franklin. For more information, visit troop202.com.